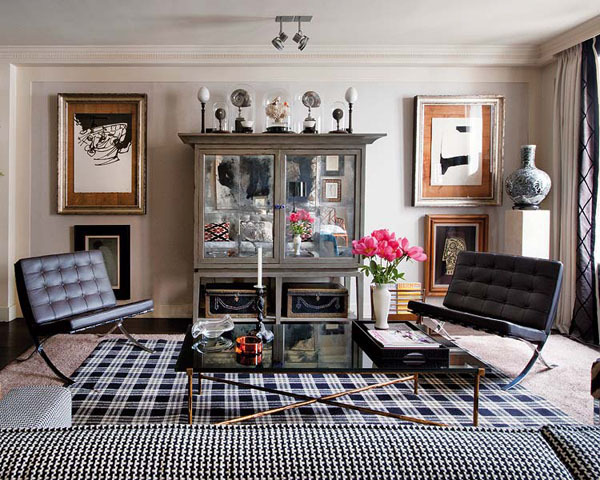 There are so many elements in this home that speak directly to my aesthetic- the art (you all know I love art), the plaid (I have posted about it here), the use of pedestals which I urgently need in my home (I posted about them here), and the mastered mix of modern and antique furniture. 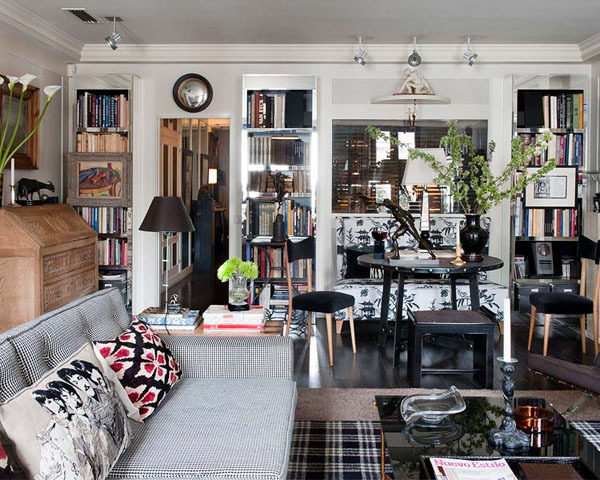 This home is of Spanish interior designer and architect Javier Castilla. 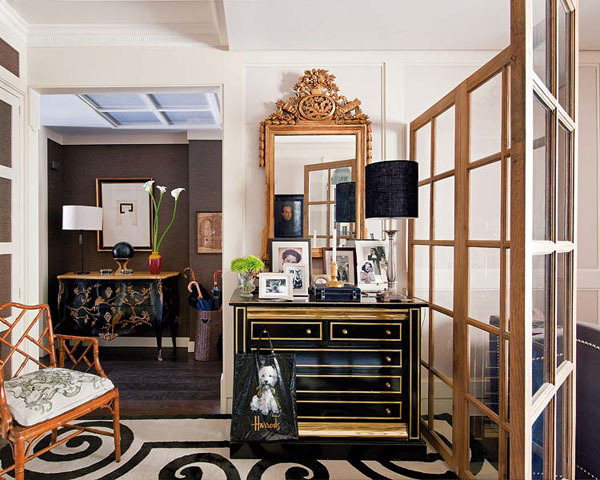 In love with the mirrored bookcases, the banquette, the grass cloth wallpaper on the hallway....and everything else I mentioned before. Fabulous! So chic and cozy. Yes? Oh and I'm guest posting over at sweet Elisa's Fancy Free Me blog sharing my favorite DIY- Can you guess which one it is? Come find out. I love how the house feels busy, but not cluttered-it's more like there's just something to draw your eye in everywhere you look. Gorgeous find! Ok. This is beyond fabulous. Let me just tell you. Me encanto esa decoración Albertina ,con mucha elegancia y colorido , me encanto esos muebles negros con dorado!! This home is gorgeous, typically I don't like as many dark elements but I am really drawn into this too - I love the dining area! Stunning and I understand why you love this home Albertina! 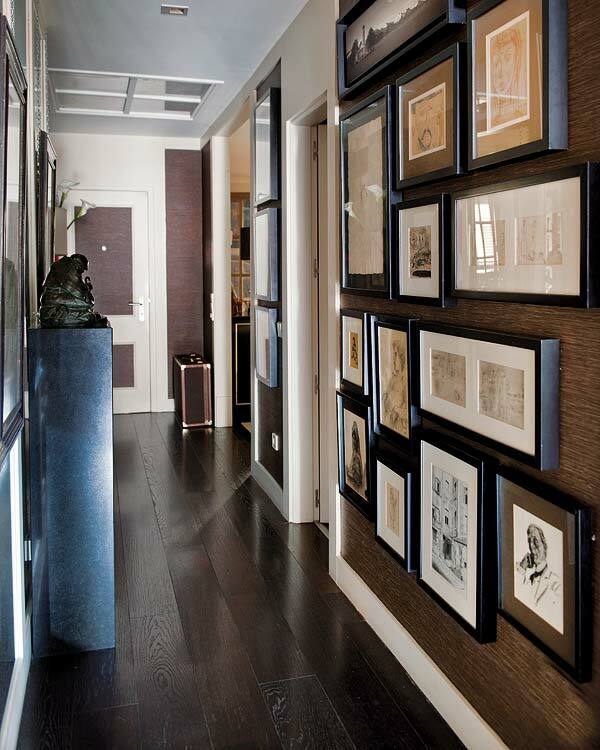 The hallway gallery wall is also gorgeous with the grasscloth on the walls. Oh wow, this is stunning! 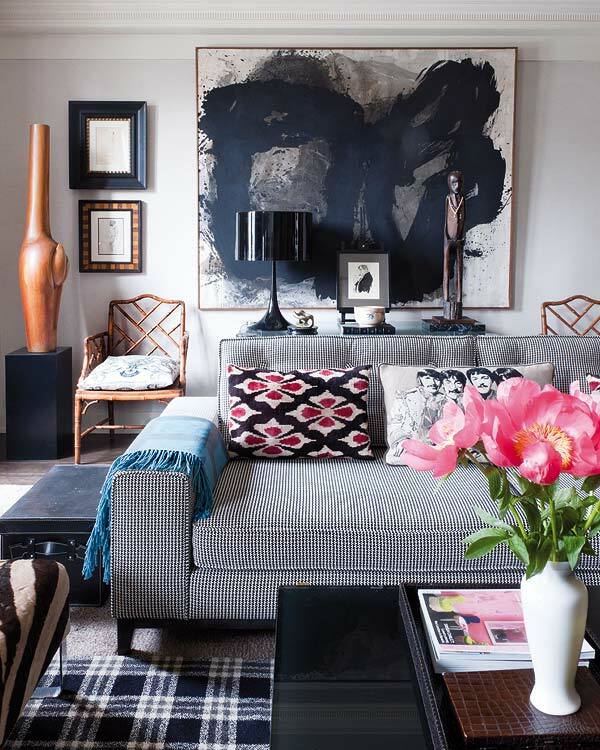 So perfectly styled and curated, LOVE it! wow what a gorgeous home. i love that it is mostly black and white but doesn't seem overly masculine. and that settee is so amazing! Oh my I'm DYING over that first photo. Can't even find words to describe the level of chic! I need that sofa in my house. And that rug, and the walls and pretty much everything. LOVE. The art in that first picture is rad. Homes with nice lighting look so elegant when they are in mostly black and white! I love everything about this home...such a great mix of masculine + feminine and the hallway gallery wall is so gorgeous!! What a beautiful home. I love how it mixes so many styles. Beautiful space, just beautiful. That hallway closed the deal for me. I love the grass cloth paired with the sleek black frames. Right up my alley! what a gorgeous home. So edgy but homey at the same time. Love all the modern mixed with traditional. so beautiful! like whoa. i think i've seen that first shot before, but never the rest. gorgeous!! !